Products & Services Drop Me! Uninterruptible Power Supplies Drop Me! 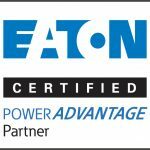 CRS has partnered with power management provider Eaton to provide a range of quality power management solutions under the Eaton Powerware brand, with Eaton “consistently delivering the high 9s of availability demanded by today's digital economy”. Our vast industry experience and long-standing relationship with Eaton allow us to provide efficient and effective UPS solutions, delivering the best power solution for your specific requirements. Eaton's UPS range encompasses both single and three-phase models, with the most suitable device determined by the requirement for protection against nine common threats to data and hardware components: power failure, sag or surge, undervoltage, overvoltage, line noise, frequency variation, switching transient and harmonic distortion. We also offer power factor correction and local or remote power management solutions. The Eaton Relay Card-MS enables automatic shutdown and network monitoring of UPS system status through a connected computer with a dedicated adapter that provides the essential dry-contact interface between an Eaton UPS and any relay-connected computer as well as a variety of industrial applications. The Relay Card-MS is compatible with all Eaton UPSs that have a Minislot. The Eaton HotSwap MBP series is made of versatile, flexible 2U PDUs designed to add high availability to UPSs up to 3,000 VA. Any UPS connected to a Hot Swap MBP can be replaced for maintenance or upgrade purposes without interrupting the power supply to the protected devices. As a unique feature, they can be screwed at the back a Pulsar UPS, either front-facing or rear-facing, on the left- or right-hand side, for maximum versatility. They offer multiple mounting options for rack enclosures, wall mounting or connection at the rear of a UPS, whatever its brand. Eaton's series 9 UPSs protect against all nine power problems: power failures, power sags, power surges, under-voltage, over-voltage, line noise, frequency variation, switching transitions and harmonic distortion. Eaton's series 9 comprehensive protection minimises the opportunity for component stress, burnt circuit boards, data crashes and program failures. Series 9 UPSs offer the highest level of power protection available and are always recommended for mission-critical applications like server farms, hospitals and Voice Over Internet Protocol (VOIP) applications.